Are you a kid who loves cars and loves to paint? There is an awesome activity you can do that combines the two into a messy, colorful piece of art that you can display in your house or even give to a friend. This is a fun, unique activity that you can do by yourself, with a grown-up, or with your friends. 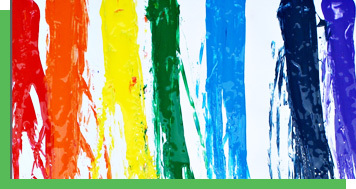 Most kids have painted before using paint brushes, sponges, and maybe even your fingers. But, did you know, that you can actually paint with your favorite car toys, too? too? Painting with car toys is a really cool way to experiment with different art media and explore how different colors, shapes, and textures all interact together to create an awesome, one-of-a-kind masterpiece – using cars! 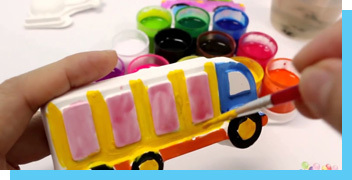 This project will use favorite car toys to paint instead of a paint brush or your fingers. The different wheel size and treads on your cars can create wild and dizzying designs on your paper – making a new and unique masterpiece all your own. This may seem bizarre and strange when you first begin, but give it a chance and I’m sure you’ll soon be zooming across the page and creating designs no one has ever seen before! Toy cars – from matchbox cars to big Tonka trucks, choose your favorites! Remember to let your masterpiece dry completely before you display it and wash your toy cars every time after you paint with them to keep them clean and running well! How do I begin to Paint with Cars? First, ask your grown-up if it’s okay for you to do the project – this project is meant to get messy and fun and it’s important that your parents give the okay before you begin. Once your parents give you permission, you can begin your journey into car painting and experimentation. The first step is one of the most fun - choose your cars! You can use anything from small matchbox cars to large Tonka trucks – the more unique and different, the better. 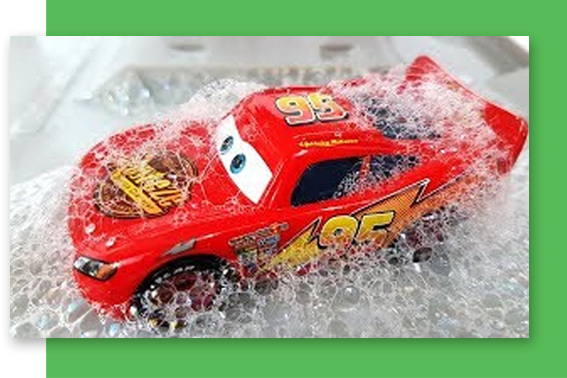 Be sure to only use cars that can be washed in mild soap (so, no fancy collectables or cars that can’t be submerged in water) because after you create your piece, we’re hosting a fun, bubbly a car wash for all the messy toys! Look for cars that have unique treads on their tires or ones that are super big or really tiny. This will create interesting patterns on your track. 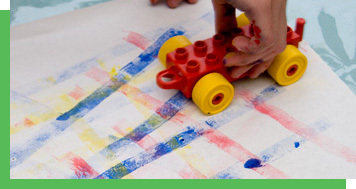 You can even choose to use other toys in your creation – maybe a plastic dinosaur can create wild tracks across your painting or you have some neat stamps you’ll like to add to your tools. The sky’s the limit in the creation of your painting! Next find some paper to use as your track. This can be anything from butcher paper that you unroll to create a long road to smaller pieces of scrap paper or even leftover newspaper. You can experiment with different papers and sizes while you create to see which you like best. You might even decide to do a few trial runs on scrap paper before you make your final pieces to see what each car’s tread design looks like. It’s all about the process! Your next step will be to find some paint to use. 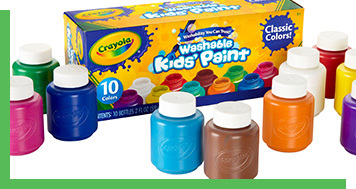 This is a good time to talk with your grown-ups again to make use you’re using safe, non-toxic, washable paint. We’re going to dunk those cars (and probably your fingers!) in that paint so we’ll want to make sure it’s safe and that it will wash out of clothes and cars. Next, find your art-making space. This can be in the garage, outside on the sidewalk, or even at your art table. You can get creative and set up different ramps and pathways to use as well. Experiment to see if it feels any different to create art inside or outside, standing up or laying on the ground, you might even try hanging your paper on the way for some vertical car painting. You might even notice that the designs look different to you depending on where you created them. Squirt different colors of paint onto a palette or paper plate. You can choose any combination of colors that looks good to you. Next choose your paintbrush – I mean your car! Choose one car and roll the wheels in the paint of your choice. 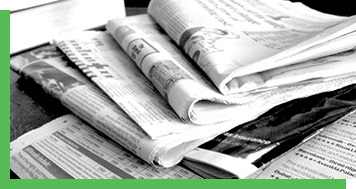 Next, drive the car along your paper to discover the neat designs and colors of the tread. You can do a lot of experimenting with mixing colors on the wheels or changing cars on the paper to create a design that’s unique to you. Sometimes it’s even fun to put a glob of paint directly on the paper and run your car through it like it’s hitting a puddle! You can use car wheels and even your fingers to add to your design to bring what’s in your imagination to life. If you’re creating art with a friend, it can be really fun to take turns racing cars on your track and seeing the designs that can happen when two people work together. You might discover it’s more fun creating a piece together than it is making one on your own. Make a mess and have some fun choosing different cars and colors and driving different paths on your paper. Once you’re satisfied with how your painting looks, set it aside to dry for at least an hour. You can then decide you want to create another or you can begin to set up the fun clean-up carwash. TIP: Remember, your paint will be wet, so you’ll want to put your painting someplace safe where it won’t be disturbed. Well, now that you’ve created your masterpiece, you probably have quite a few toy cars with paint all over them. We don’t want to leave them dirty or the next time you go and try to play with them the wheels may stick and the paint will have dried. Instead, make sure and take care of your tools and wash them properly. The good news is that the second part of this art project is a bubbly, fun carwash! How Do I Prepare My Carwash? Before you begin cleaning your toys, you must prepare your carwash. You can do this either in a sink, in a bucket or in a tub outside. Ask your grown-up which one would work better for your family. Begin by adding water to your sink or tub. 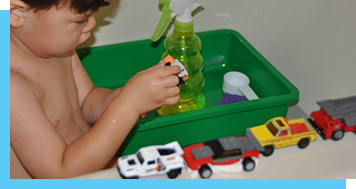 As the water fills, add a few drops of mild dish soap to the water, creating a toy car bubble bath! Once your sink or tub is full, take your cars one by one to the carwash and scrub, scrub, scrub! You may need to use a soft sponge to clean up all the paint. TIP: Be sure to watch the bubbles in the water change colors as you wash! Once you completely clean the paint off of a toy car, use a soft, dry cloth to give it a good dry and polish so it sparkles again. Work your way through all your cars until you have a bright, clean fleet again. Want even more fun? Add Foam! What happens if you loved to paint with cars, but you want to try something a little different? Make it a foam party! 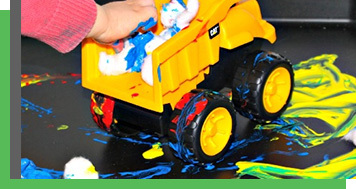 Instead of using washable, non-toxic paint, you can use shaving cream that’s been mixed with food coloring to create a wild, off-road car painting experience. This is also a really good activity if you have a little brother or sister who likes to play with you because they will love the feeling of foam in their fingers and exploring art with you. 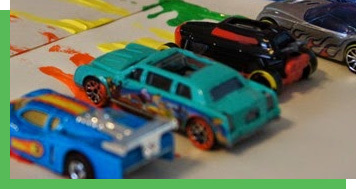 The difference between regular toy car painting and foam toy car painting is that instead of using washable, non-toxic paint, you mix together food coloring and plain ol’ shaving cream to create your paint. This makes a smooth and fluffy paint that can then be piled on your paper and driven through with your cars to create designs. It’s super fun to see how you can make different shapes, colors, and tracks using the texture of the foam and if you get any on you accidentally (which you probably will – the mess is part of the fun!) it washes right off easily. But beware, fun will explode and so might the shaving cream as you cruise through it. 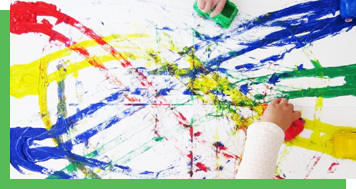 This is an activity that is best done outside or in an art-making space that’s designed to get a little messy! 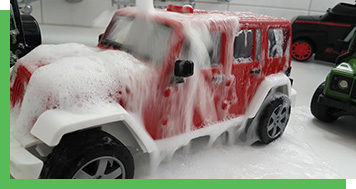 Once you’re done experimenting with shaving cream painting, take your cars back to the carwash to get squeaky clean and ready to ride another day. You can use the same mixture of mild soap and water to wash your cars again. The good news is that with foam, you probably won’t need to do any scrubbing – it should come right off. You should still make sure you dry and polish your cars before putting them away so they are ready to play with next time. Your foam paintings may take a little longer to dry than your washable, non-toxic painting, and you will notice the foam starts to evaporate and create really neat patterns on your paper. Make sure you allow your paper to dry completely before displaying your new work of art on the fridge or giving it to a friend. Once you get the hang of painting with cars, it’s really neat to experiment and see what happens to when you try different things. Below are a few fun tips to try – and you should always feel free to explore in your own way through art, too! One of the coolest things to do with car painting is experiment with color mixing. Did you know that the colors red, blue, and yellow are called primary colors? And those primary colors mix to create all of the other colors we see. Sometimes all you need is red, yellow, and blue paint to create a masterpiece of many colors! See what happens when you run your toy cars through the following paint combinations on the paper. What do you notice? •	Use your car to race through yellow paint and then race through red paint! •	Speed your car through blue paint and then skid into yellow paint! •	Zoom your through red paint and then swerve into blue paint! It’s also fun to see the differences that you can make by pressing your car harder or softer onto the paper. Do you notice anything about the design? What if you tried moving your cars back and forth over the same tracks – what do you think would happen? 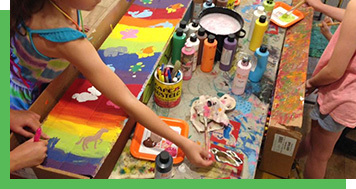 What happens when you make a painting using both the washable, non-toxic paint and the foam paint together? What does it look like when it dries? Does it dry at the same time? 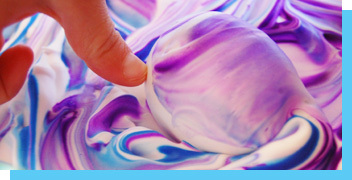 I hope you have fun experimenting with paint, foam, and cars to create a unique masterpiece for your fridge! There are so many things you can use to create art; it doesn’t just have to be traditional things like paintbrushes and easels. By exploring different uses for everyday things, you can learn new ways to see and experience the world around you. Happy car painting!